a self-organizing educational program for which the curriculum and schedule are proposed by the general public. 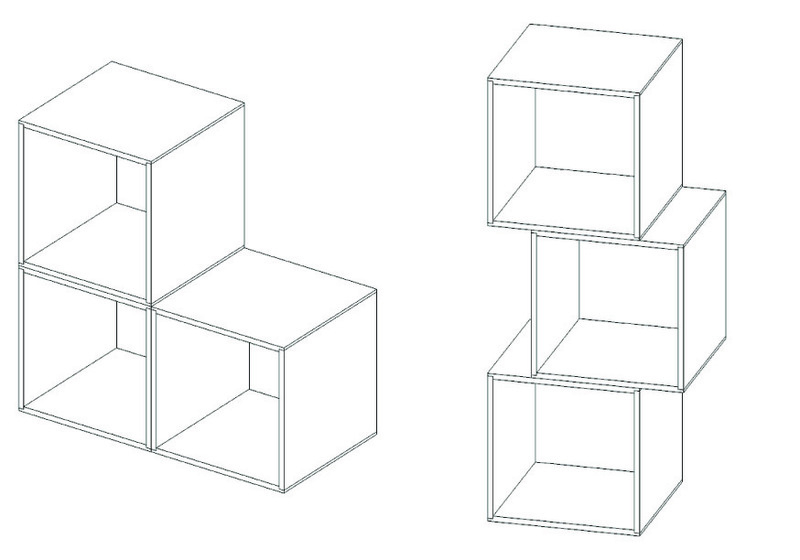 4 – axonometric of public furniture. the specific configuration of the units – stacked, dispersed, grouped, chaotic – suggests the current state of activity. 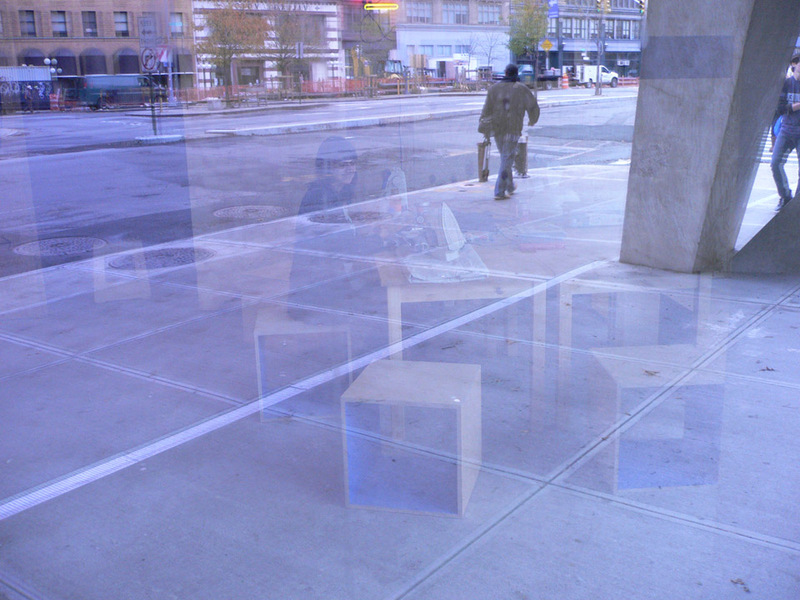 5 – the public school for architecture at the center for architecture. the neon light as an abstraction of the logo. 6 – setting up for the sewing circle at the performa hub. november 15 2009, 10:00am. 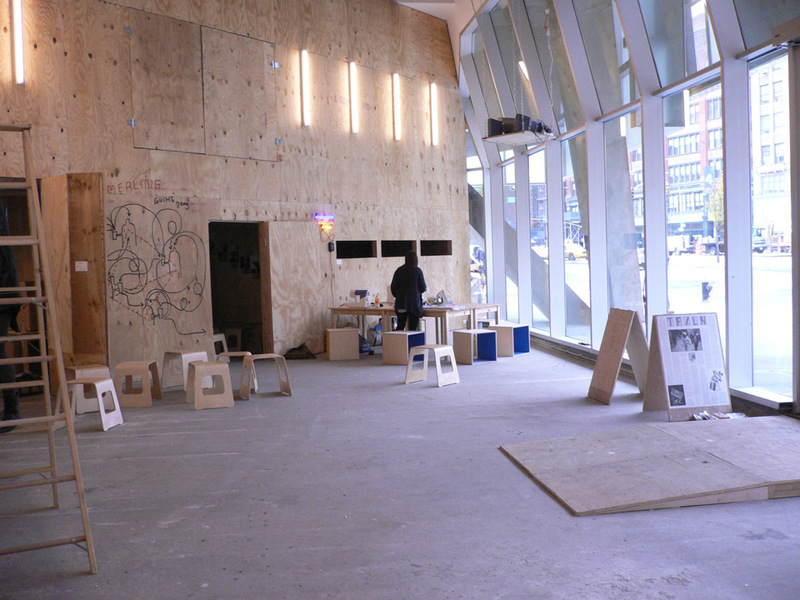 7 – courses were held in a series of itinerant classroom installations located in transitional public spaces; lobbies, thresholds, large corridors, cafes. 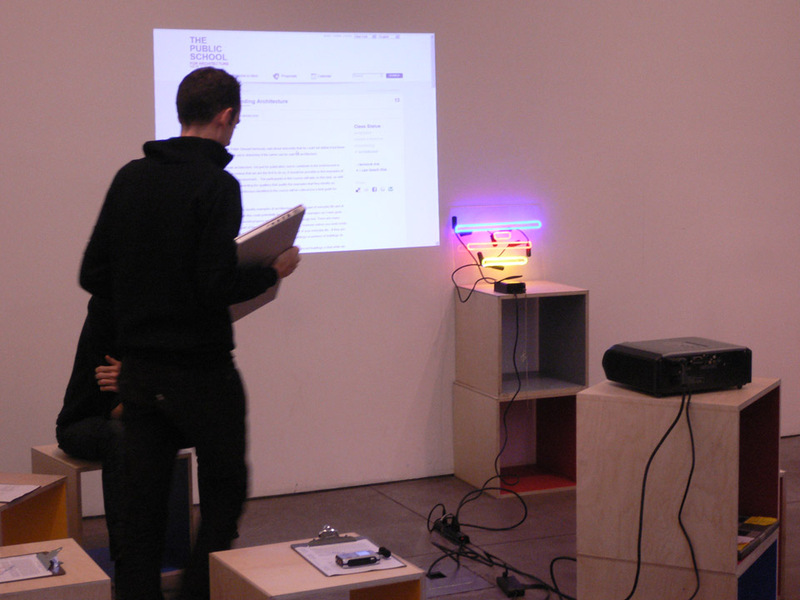 administered by common room and telic arts exchange (in collaboration with performa), courses for the public school (for architecture) new york were held in classroom installations located, temporarily, within existing cultural institutions throughout new york city during the fall of 2009.
the curriculum for the public school (for architecture) new york was proposed and administered through public access to its website (nyc.thepublicschool.org/), and the development of course topics and class participation was open to non-architects and architects alike. the school’s mission was to create a public for architecture while opening up architecture for the public. the participating institutions were the aia new york chapter center for architecture, the van alen institute and the columbia university gsapp. the intention of the public school (for architecture) new york was to work between these institutions. the project sought to identify and inter-connect a community of users within and in-between these institutions. a standard set of multiple-use furniture pieces was produced by common room and located within the spaces of the institution. the pieces established the material aspect of the classroom site and created a forum for informal and planned events associated with the project. the public school (for architecture) new york offered the opportunity to negotiate public space beyond the limits of our current practice. it was also a means for the general public to access an architectural culture that is typically out of reach, inside the institution of architecture. the public school new york now continues without the disciplinary affiliation and is administrated by an expanded set of committee members. the public school (for architecture) new york was a van alen institute new york prize fellowship, and is supported in part by the andy warhol foundation for the visual arts and the annenberg foundation.